I’ve written about these before but here I go again: these cookies are really so delicious that they’re irresistible. 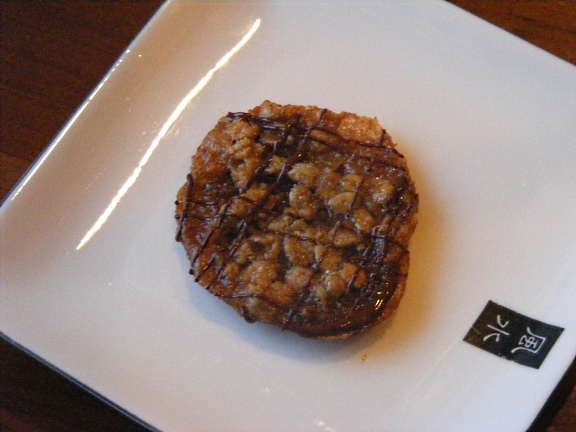 Lace cookies (aka, Florentines) are crispy, wafer thin cookies with an amazing carmelized sugar and browned butter flavor that sandwich a thin layer of dark chocolate. Jenny is throwing a party on Sunday and wanted a few goodies that can be eaten by everyone, including a few guests who can’t have gluten. If you take a look at the original lace cookie recipe, you’ll see there’s a minimal amount of flour, making it easy (ridiculously easy) to adapt to gluten free. We swapped out the flour for almond meal (left over from December’s Daring Baker Challenge) and, to be on the safe side, used gluten free oats (meaning, they were not processed in a facility near wheat products). The result is virtually identical: the only differences I’ve noticed are a slightly nuttier flavor than the originals (duh) and the GF version seem to have stayed crisper longer. Preheat oven to 350-degrees and line baking sheets with parchment paper. Mix the oatmeal, sugar, flour, and salt in a bowl. Stir in the melted butter, then add the egg and vanilla and mix well. Arrange the batter by half-teaspoonfuls on the sheet, about 2 inches apart on the baking sheets. Bake until lightly browned, about 5 minutes. Cool slightly and remove the cookies with a spatula as soon as they are firm. (If they become to hard, pop them back in the oven for a moment to soften –- but my kitchen if icy and I’ve never run into this problem, so you probably won’t have to worry about it.) Yields about 60 cookies. Once the cookies cool, place them gently in an airtight container or continue to the next step. Place chips into a microwave-safe, plastic zip-top bag. Microwave for approximately 1 minute on 40-percent power, and “smush” the chocolate with your hands. Continue microwaving the chocolate for 30 second intervals at 30-percent power until melted, smushing between turns. Once your chocolate has melted, snip a small corner off the bag to create a homemade pastry bag. Place a small dollop of chocolate in the center of a lace cookie (flat side up) and delicately top with another cookie (flat side down against the chocolate). Press the cookies together gently so the chocolate spreads evenly. Rest to dry on a cooling rack. If you have leftover chocolate after filling the cookies (you probably will) squeeze the chocolate into another zip-top bag. Line your cookies up on your cooling rack, placing paper beneath the rack to catch extra chocolate. Make a tiny snip in the zip-top bag’s corner so that when squeezed, you’ll get a thin ribbon of chocolate. Working quickly, squeeze the chocolate over the cookies on a diagonal from left to right. Your cookies should have little chocolate stripes. Repeat the technique, this time moving from right to left. Now your cookies should have a diamond pattern on them. Don’t worry about being perfect; they’ll look beautiful. (If you’re feeling ambitious, melt white chocolate and drizzle on the cookies for a nice contrast.) Once dry, store in an airtight container.